If you haven’t heard enough of my enthusiastically chirping about how I was on the front page of the Beckett website, buckle in – because I’m about to say even more. Last night, I was a bit bummed out because I was taken off the front page. I knew it had to end at some point, but I was still bummed about it. It was a mixture of bummed-outness and thankfulness. I feel so incredibly blessed to have been featured on the website! Not too long after that, I found out I was going to be in the ACTUAL magazine! To me, this is a HUGE thing. I have been reading Beckett Monthly since I was 9 years old. 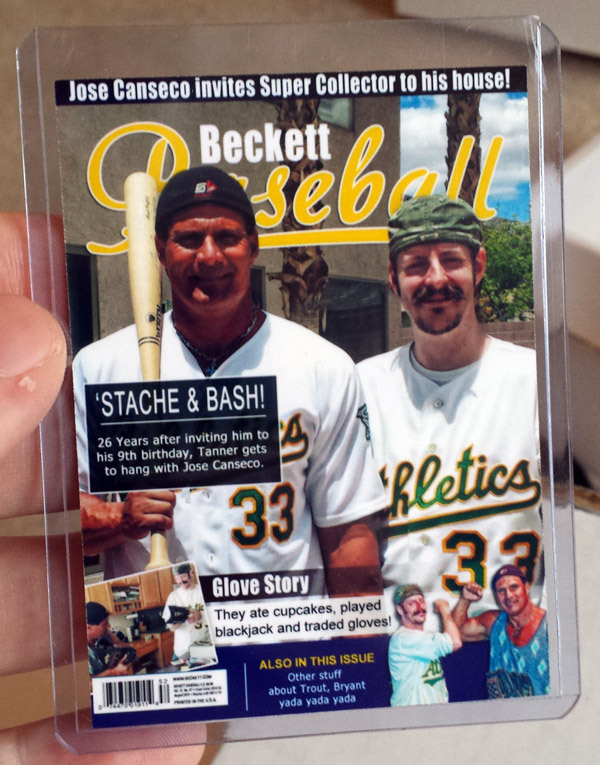 For those of you keeping score at home, that means the first time I picked up a Beckett was about 26 years ago. 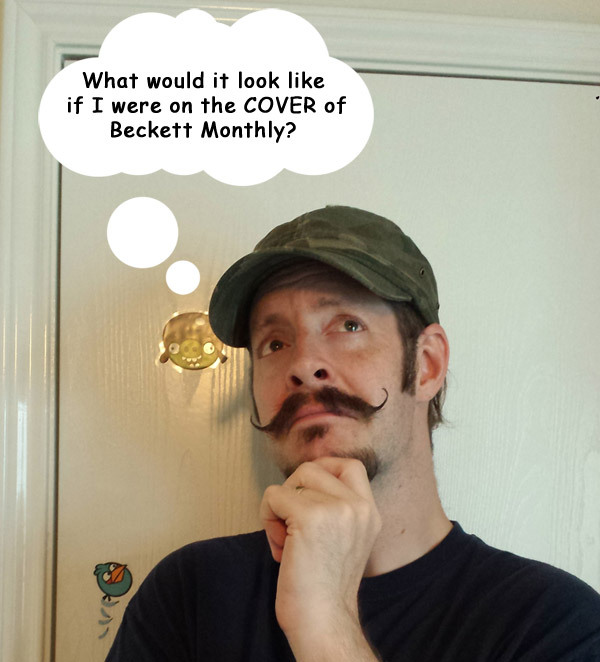 Growing up, I was an avid reader of Beckett monthly. The articles would soothe me throughout the long, cold off-season. I would see articles of people who are “super collectors” of a certain player. I remember seeing one kid who had 9 1989 Upper Deck Griffey rookies, and thought to myself “how the heck does that happen?? 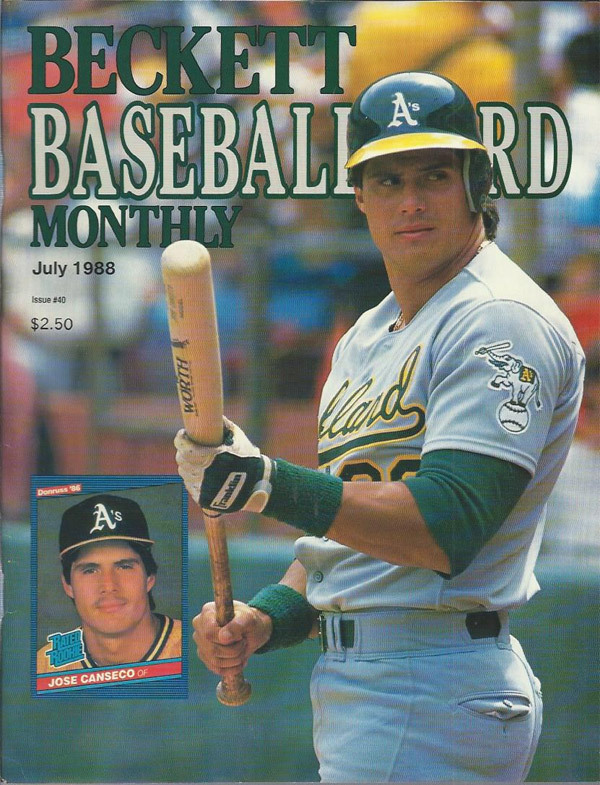 ?” I dreamed that one day, my Canseco collection would propel me into the pages of my most beloved magazine. I know, I know. I’m not featured with my collection. Instead, I’m featured with my favorite player. I will totally take that instead! I’m not sure I can emphasize how important the hobby’s #1 magazine has been to me. Keep in mind when I was a child, this was before the days of mobile phones, tablets, ipods, etc. Whenever I would go somewhere that would require me to exercise patience, I would tote the latest issue of Beckett with me. Beckett got me into studying the value of things, and was pretty much the only thing I read when I didn’t care much for reading. It also got me through those long, hard baseball-less months from November to April. If there is one thing you should know about me, it is that I’m a BIG dreamer. Ever since I heard I would be in the magazine, I started day-dreaming. (Yes, I do have Angry Birds decals on the back of my office door.) I try my best to temper my big dreaming with very conservative expectations of how it will play out in reality. It doesn’t help my cause being a self-professed photoshop ninja, though. Like I said, I am a BIG dreamer. I don’t know about you, but I think that would make a fine cover! Heck, this would dethrone my previous favorite all-time Beckett cover! 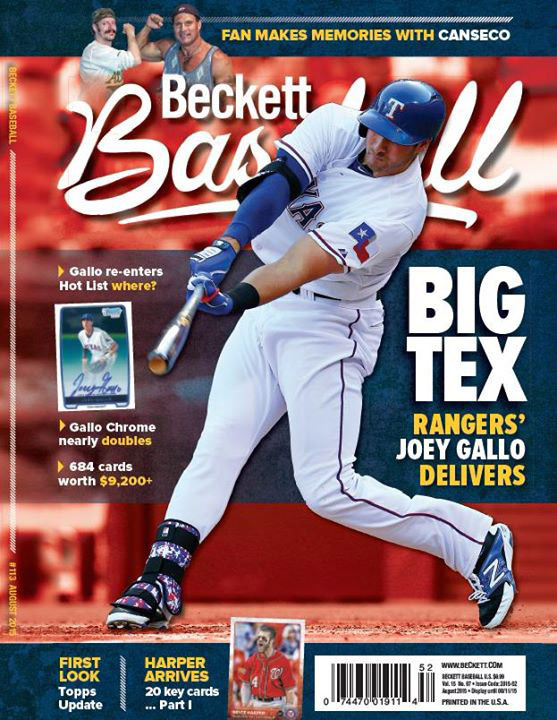 After coming back down to earth, and thinking more about reality, I came to grips that while I may not be on the cover, I still feel like the luckiest man on the planet to have been able to hang out with Jose for the afternoon, AND be in Beckett … not matter how small the article would be. I got an email …. Do you see that?!??! I’M ON THE COVER!!! No, no, no – not the dude in the Rangers uni. Look at the very top! 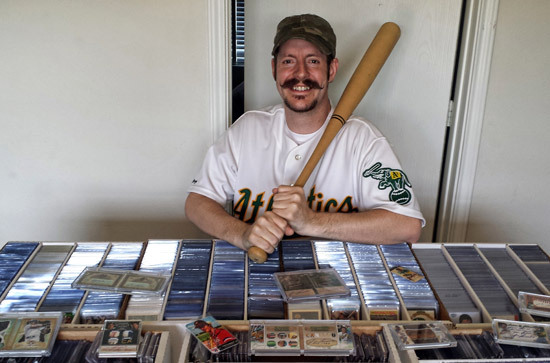 With very few card shops around in my area, I may need to hunt around for an issue when it hits the stands, but until then, I think it is going to be very hard to sleep and perhaps even harder to remove this smile from my face. Livin' the dream – that's awesome! Now I've got to go buy a magazine! That is SO Cool. Congrats. Wait does Beckett even print the magazine anymore? They sure do – many card shops have dried up, so it is probably harder to find them nowadays compared to the 90's. Walmart, my friend – most of them carry the mag in their book/magazine section. Thanks for the tip! I'm definitely going to have to check it out …. in full "people of Walmart" garb. Totally awesome. 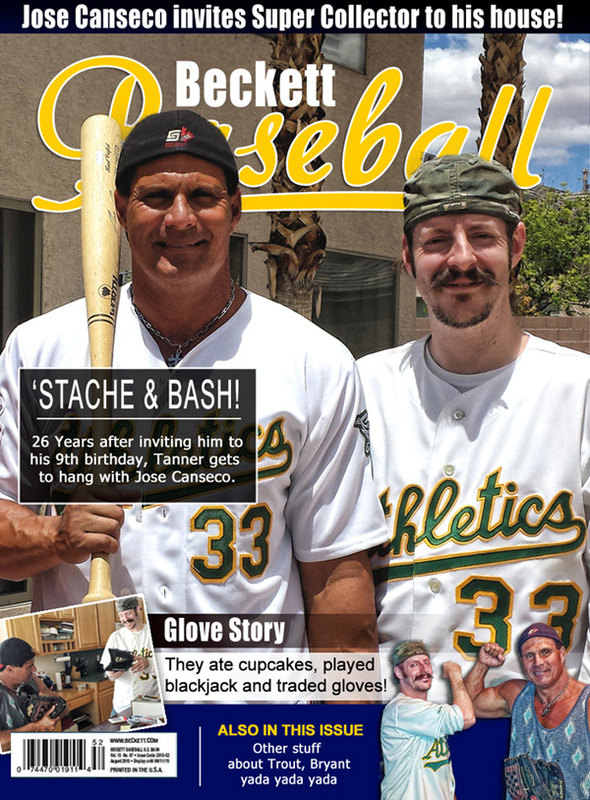 BTW, you are really starting to look like an old-timey baseball player.